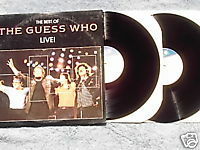 Compleat 672012-1 The Best of Guess Who Live 1986 LP; two album set contains complete concert from the Together Again release. Reunion tour includes Burton Cummings, Randy Bachman, Jim Kale, Garry Peterson. Vinyl is excellent; cover with photos is VG with some ringwear and cornerwear.